Turun ammattikorkeakoulun opiskelijakunta - TUO » Statement: TUO thanks Mayor for advancing the tramway! Statement: TUO thanks Mayor for advancing the tramway! Student Union TUO says thank you to Mayor Minna Arve for suggesting that Turku city board should start planning the building of a tramway. 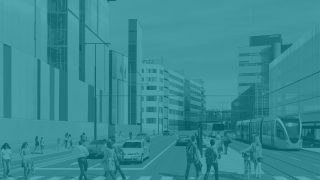 Last year, Student Union TUO released a statement supporting the building of a tramway in Turku. Turku has to be forward in renewing the city’s public transport system to make it more efficient and friendlier to the environment. The City of Turku aims to be carbon neutral by 2029, and an efficient public transport system is one major way of fighting against climate change. We students understand that a tramway is a significant investment for the city of Turku and all its inhabitants. We believe that this is an important investment to make for the future and for an even better city. A tramway will help shaping the image of Turku towards a more positive direction. By investing in a tramway, Turku shows the world it’s dedicated to developing its urban area. Investments like this make Turku a more attractive place for both businesses and citizens, which in turn creates more tax money for the city. We students wish the city of Turku will prepare the tramway carefully, so that the project stays within its agreed schedule and budget. In recent years, we’ve seen many city planning projects in Turku go prominently over their budgets and extend their schedules significantly. We hope the tramway won’t be one of these projects but will be well-planned and stay within its schedule and budget. Student Union TUO wishes Turku city board and city council will make wise, forethought decisions on this issue.